It’s starting to look magical! Home / It’s starting to look magical! Here we go – today was class day. Lesson #3 of Melissa Shirley’s heart. It’s starting to take shape. There was a lot of ground work to do before we could really start seeing things happen. Background, borders etc. But now, I am quite pleased with it. 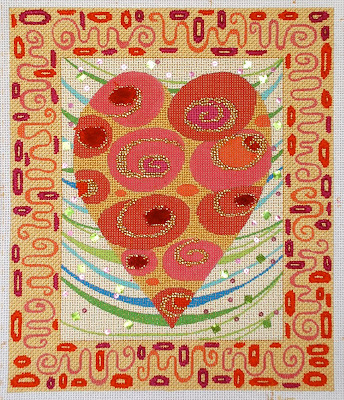 The background of the heart is simply Basketweave in metallic. The star of the show are the swirls that run through the abstract flowers on the heart. They are beads. I know, shocking! Here’s what’s special about the beads, they are a mix of 3 different finishes. I mixed different shades and colors and finishes of beads together so that optically I get a unique color. In this case I used 3 different golds. Each sparkles and reflects light differently. The sparkle then bounces from one to the next. Pretty cool. If you are going to try this, you also need to be okay with the fact that all beads are not created equal. Some colors of beads are rounder, some more rectangular, so when mixed they don’t always sit as straight as if they were all the same. Again, I’m okay with this, it’s much more organic this way. Finally, the centers of the flowers were filled with either Basketweave or Turkey Work. The Turkey Work medallions are very cool and fun to touch. One more class and we’ll see what we’ve created. Fascinating! This is so much fun to watch, Ruth, that it must be real fun to stitch.